Recently, I had the chance to interview Daaneth McGettigan (account name Daaneth Kivioq), the co-captain of the Passionate Redheads Relay for Life team, and the owner of the Southern Colorado sim. We sat down at the meeting area at the sim near Fimi Falls. During this time, Daan’s cat in real life wanted attention. So, he rezzed a virtual one on his lap. Bixyl Shuftan: About your Second Life name, does it matter whether people use your account name or your displayed name? Daaneth McGettigan: No - either way, if they search for me, they will find me. I know that display name support is not perfect, but that does work. For example, it says "Kivioq" when I IM someone. 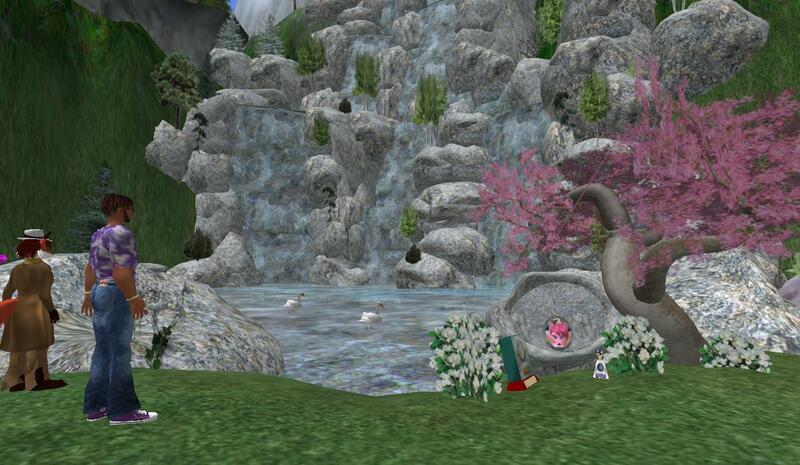 Bixyl Shuftan: So where did you find out about Second Life? Daaneth McGettigan: That’s an interesting story. Seven years ago, a good friend of mine in real-life, known as Krysis here, talked me into trying it out. I was overwhelmed at first. 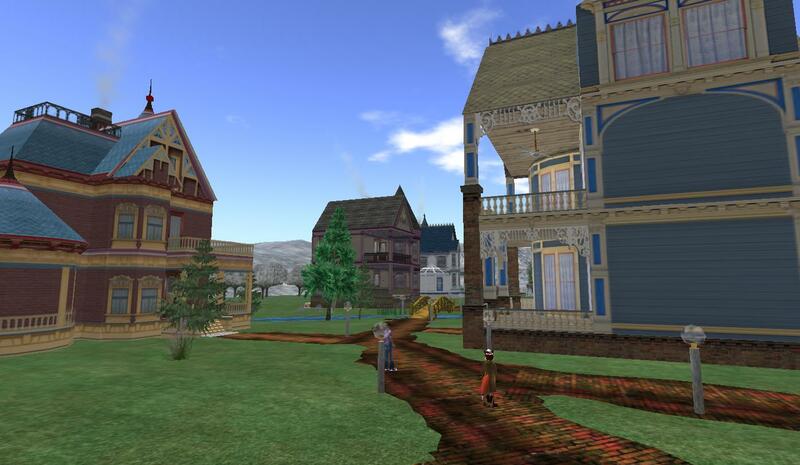 Second Life was nowhere as sophisticated as it is today. I almost quit, but friends here talked me into staying. Some of them are still here, but most have left, among them Krysis. We still meet up in real-life though. Over the years, there’s been some huge changes in the technology. Of course, it required me to upgrade my computer several times. Bixyl Shuftan: How did you find out about the Relay? Daaneth McGettigan: Sabine introduced it to me. We had been dating for several months. I had lost a sister to pancreatic cancer. I didn’t know anything about it at first. She came to me a few days before the Relay weekend. The guy who was going to help her build the campsite disappeared. It was a 24 marathon build, but we got it done. That was my introduction to the Relay. Bixyl Shuftan: How many were in the Passionate Redheads at the time? Daaneth McGettigan: There were another five members. There were a few more, but not active. Sabine and I pretty much moved on. We worked at Burning Life that year, and by December we were partnered. For the Relay next year, we made an Ice Palace build. We still have a number of pictures of it." Bixyl Shuftan: When did the Redheads start to take off in size? Daaneth McGettigan: In 2008, we started recruiting actively. It was our second best year at fundraising. We managed to raise $10,000. It was the year Fimi joined the team. She was active for a while, until she was too sick to participate. She passed away on May 26th, 2008. She was really, really, loved. We were impressed with her spirit. Since then, the team has done really well. This year, the team kind of split. I’m kid of happy, we both raised more money. We raised just over $2,800. Bixyl Shuftan: What’s the name of the other team? Daaneth McGettigan: Inspired Dream Walkers. One of them thought we were getting too big. I think they just wanted to do their own thing. In 2008, we were awarded the Golden Level Team Award. In 2009. we were awarded the Spirit of Relay award. I think Sabine deserves most of the credit for that. She’s worked really hard. I think this year’s build is the finest team effort Lom(gren Smalls) acted in charge, but also Dusk (Griswold), Shockwave (Yareach), and the others. Bixyl Shuftan: How is it having the smallest avatar in Second Life on your team? Daaneth McGettigan: He may be the smallest guy in Second Life, but he has a big heart. Maybe I should bring up the stroke. Daaneth McGettigan: Well, it was like out of the blue. It happened in April Fortunately, I got to the hospital. Scary time. I didn’t realize what was happening. Lomgren and Sabine tracked me down. Sabine really helped me. (pause) I don’t really have words to describe it. The first few days were especially confusing. I had problems forming the words. I still have gaps in my memory. My Mother flew over. She stayed for about two months. I was also fortunate to have a very good team of therapists. I would like to point out one for his work: Dr. Pio Guerro. While in the hospital, I heard that the Relay threw a “Get Well” party for me. That really moved me, brought me to tears. I wish I could remember all the teams involved. Me being out of commission put a halt to fundraising. I made it back in time for Dusk’s Cinco De Mayo party. It was a wonderful homecoming. The hardest thing, it was learning to type all over again. I still prefer Voice over it in Second Life. I’m also having to relearn math skills. Relearning calculus is necessary for my line of work. Bixyl Shuftan: So what have been some of the more inventive ways for fundraising. Daaneth McGettigan: That would be the “Bid Me Human” events. A couple years ago, I did a “Bid me Furry” event offering to go about in a furry avatar for a little while if 10,000 Lindens were raised. This year, there were three “Bid Me Human” events, the ones in which Nydia and Rita volunteered for were particularly successful, especially Rita’s. I believe over 70,000 Lindens were raised. Bixyl Shuftan: Rita Mariner being the one who runs the Sunweaver Estates, do you think there was a “needle the landlady” factor? Daaneth McGettigan: Maybe, but I think it was done all in the name of fun. Rita was a good sport about it. Also, we did a pinup calendar with various Redheads in swimsuits. Plus we made a cookbook from various recipes contributed by a number of Redheads. About eighty copies of the cookbook were sold. Both are still on sale until August 20th. Bixyl Shuftan: So what do you do when not Relaying? Daaneth McGettigan: Sabine and I like to go to clubs and concerts. We also hang out at Sabine’s tropical island. I gave it to her as a rezzday present. It’s modeled after her favorite real-life place, an island off the coast of Florida, Anna Maria Island. We also explore, go building. Sabine also likes to go shopping. Bixyl Shuftan: Shopping? What was the biggest thing she ever bought? Daaneth McGettigan: Probably a furniture set. I think I once bought her a kitchen suite. She likes to collect hair. Most of it’s red, but not all of it. Her favorite color is pink. It’s been an interesting journey. I don’t know what I’d do if she was no longer online. Bixyl Shuftan: So what are your plans for next year? Daaneth McGettigan: Right now, I don’t want to think of next year. We’ll take it easy for a little while. Daaneth then showed me around Southern Colorado. The sim was established in 2007. In 2008, he dedicated it to the Relay. He used it to host events, and still does, dances and meetings held here. Not far away from the meeting area is Fimi Falls, named for Artistic Fimicloud whom was known to really like them. Daaneth pointed out something in one of the pine trees at the falls: a pink ribbon. This was another tribute to Fimi, whom liked to put a pink ribbon somewhere in her paintings. Near the falls was a treehouse. At the base there three luminaries, one from this year’s Relay, and one from 2010 and 2009 respectively. The treehouse itself was well-furnished with Victorian furniture. It gets a few occasional residents. Not far from the treehouse and meeting area was a garden dedicated to Saint Therese of Lisieux, “Sabine’s favorite saint.” Near that is the Soldiers’ Memorial. Close by is the cat carousel, or the “catousel” as Daaneth calls it. There’s also a balloon ride, courtesy of Shockwave Yareach. A little down the path is an Elven drum circle and a campfire. Crossing a river, there is the “Chapel of Hope,” which was built for the 2010 Relay camp. Of the streams, Daan commented he was fond of them and the waterfalls. Daaneth then showed one feature relatively new to the sim, houses for rent. There were five Victorian homes, which were available at prices from 7,000 to 8,000 Lindens a month. Anyone interested in one could contact him or Nydia Tungsten. Going up a path to higher up, there is a building Daaneth named the “Philosophy Shack.” Daaneth forgets just how he came up with that name. Not far from that is a virtual herbal garden. Accessible by one of a few portals around the sim, or by flying over, is Southern Colorado’s Enchanted Forest, another popular spot. Danneth described the place as having a lot of nooks and crannies for couples to snuggle. The Forest is also the scene of occasional parties, such as the recent fundraiser where Cypress Rosewood performed. After that, Danneth, had one other location to point out, and ported us to the high point of the sim: Mount Sabine. We were on a platform just below the peak where a huge Coloradan flag flew in the breeze. Snow sprinkled down where we were. On a slightly shorter peak, a angel statue looked down at the sim below. And nearby within sight was Club Little Dove. After that, Daaneth and I parted ways. So is the story of the co-captain of one of the Relay for Life’s most successful teams, and the sim behind him. One typo - that was a Kitchen set, not a hidden set.